Juvia paused her walk once again and just stayed in silence. “After all these year, I’m just a guildmate to you now?” Juvia just stood there with a pair of cold eyes looking straight ahead at nothing in particular. “I’m no one special to you now? Just a guildmate?” Juvia still didn’t response and just started walking away toward the door in silence, leaving the helpless mage behind in his despair. Is this how she felt before? Juvia, is this how you felt before? Cold, empty…lonely? I stood there petrified, looking toward the door. The door that Juvia walked out. The door that led her out of my life. What have I done? Is it really too late? Is the wound in her heart really too deep to heal? The thought of her wound made me flinched; her once gloomy self was long gone after she came into Fairy Tail. That gloom, that rain came back to haunt her once again, and I’ve caused it. Every time I found love, they always leave me behind. No, actually I chased them out. My family, Ur, and now Juvia. I defied Ur and killed her. I’ve hurt Juvia all along and eventually, it chased her out of my life. I’m sorry, Juvia. I didn’t want to turn your life back to the dark, and yet, I still did it, didn’t I? Gomene. I want you to be happy now, even if it means I will have to let you go. Disclaimer: I do not own Fairy Tail, I only own the fanfic here. Previously: “Juvia, gomene…” I whispered softly as I headed back to the guild. ”Gray Fullbastard! !” I shouted at Gray while running across the guild. I stopped for a split second before throwing Gray a punch in the face, which sent him flying backward a few metter. I bolted forward and picked him up by his shirt collar, not giving him any chance to fight back. ”You piece of sh*t! You scumbag!” With one of my hand still holding onto his collar, I threw him another hard punch in his stomach. ”You make Juvia-chan cry again, you gotta go through me first!” I spat out my words as I pulled his collar up and looked into his eyes with ferociousness. Previously: “I think I love you,” Gray-sama said it again, slower this time. The whole guild busted out in cheers and whistles. “Tsk, Juvia is mine!” Lyon protested. Disclaimer: I wouldn’t be here writing fanfic if I own Fairy Tail and its characters. Hiro Mashima is the rightful owner of Fairy Tail. Previously: “Gray Fullbuster, why can’t you realize that you also love Juvia?” Erza swing her head right and left while massaging her temple. The guild was being as busy as ever in the morning. Chairs and tables were already flying mid-air, but there’s no surprise since this is our guild’s daily routine. And again, I was sitting at my favorite spot at the counter whiling drinking some mugs of alcohol. After I’ve came a conclusion that I do love Juvia after all, I came to this somber state. Guilt was written all over my face. Why didn’t I realize sooner? Now that Juvia is tired of waiting, I just realize my feeling? Yeah, even after I kissed her, she said she’ll move on. She is just that tired. I made her wait for too long, and now she found someone else. The danger of not admitting your feeling is getting hurt yourself. Mira’s words came back. Guess I am too late now? Disclaimer: All Fairy Tail and its characters belong to Hiro Mashima. I only own this fanfic right here..
Juvia ran and ran until her legs can’t move anymore. The pain and soreness in her legs are nothing compared to the excruciating pain in her heart. Gray-sama doesn’t love Juvia. He is playing with her because of his rivalry with Lyon-sama. Right? If he does like her, he would have told her long time ago, not only after Lyon-sama came. Gray-sama just wants to win against Lyon-sama. He doesn’t like her. *sob sob* Yeah, he doesn’t. Stop dreaming and stop getting your hope up, Juvia. 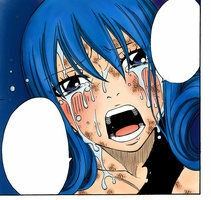 *sob* When will Juvia ever learn? Gray-sama never liked Juvia. And never will he. He’s using Juvia to win against his rivalry against Lyon-sama. Why Juvia? Hasn’t Juvia already suffer enough? Is she some kind of toys? When he doesn’t need her, he’d just toss her aside. When he needs her, he’d use her. *dry chuckle* Gray-sama only sees her when he needs her. In this case, when he wants to win. Juvia guesses she’s that worthless after all. One minute, he said he doesn’t care, and the next, he started kissing her. *sob* Yeah, a kiss that wasn’t really meant for her. A kiss with no feelings. Gray came back to the guild dumbfounded and confused, both from the pain on his cheek where Juvia had slapped him and his rash actions. Sitting at the counter, he was still dazed from what happened. As soon as he came back into reality, frustration took over. “Arghhh!! What have I done!?!? I’ve hurt her with my words. I made her cried.” He put his head on the counter and shook it left and right. “What have I done?” he mumbled. “Eh?” Mira tilted her head with a confused look. “It’s Juvia. We kindda.. ummm.. fought.” Gray wasn’t sure how put what happened into words. “Juvia did what!?!? She fought with you? YOU! ?” Erza, who just came to sit on his other side, sounded so shocked. Gray couldn’t reply as he doesn’t want to admit that Juvia would actually fight with him. If anything ever happens, everyone knows Gray would be the last person that Juvia would argue with. “Good afternoon, Erza,” Mira greeted Erza as she sat down. Erza just nodded her head and returned the greeting. “Soooo…. what exactly happened?” Erza asked. Jealousy? Me, jealous of Lyon? Over Juvia? It took me a few seconds to absorb what Mira just said. Jealous? Usually when a guy is jealous over a girl, it means that he likes her, right? Wait, wait. I like Juvia? “Gray, I thought I’ve already told to be more resolute with her. Don’t make her wait like this forever,” Erza said in a serious tone. “Gray, it is jealousy. Admit it, you were jealous.” Mira butted in in a mischievous smirk. “I k-k-kiss her,” I stuttered while mumbling the words. Before I knew it, my lips were already on hers. “YOU DID WHAT!?!?! ?” Erza shouted, making the whole guild turning toward us. “You KISSED her, and you still say you don’t know whether or not you love her?” She asked in disbelief. Dark aura surrounded her, her eyes turned red from anger as if she would literally kill me if I say something wrong. “I don’t know what came over me. One minute we were arguing and raising our voices at each other, but then she starting crying while still raising her voice at me. I forgot my anger, and all I knew was I didn’t mean to make her cry. Her tears stole all my voice, and I suddenly had the urge to kiss her senselessly. Then my head took over, and I actually kissed her.” Why am I telling Erza this anyways? The fact that I kissed her feels weird, but to be honest, I kind of liked it. I couldn’t stop. She tried to push me, but I wouldn’t let her. “Gray Fullbuster, why can’t you realize that you also love Juvia?” Erza swing her head right and left while massaging her temple. Disclaimer: Unfortunately, I do not own Fairy Tail since I’m not that genius, Hiro Mashima is. I only own the story here. Previously: “Juvia!?! ?” Lyon gasped with wide eyes looking straight toward me. Eh? Juvia? A sudden realization hit me, and it terrified me to turn around. I was scared to see what I would see. It can’t be. It can’t be. Finally turning around slowly, the sight in front of me took all words out of my mouth. Juvia. Drip drip drop… No tears are actually falling out of Juvia’s eyes, but what are these sounds? Drip drip drop. Right, Juvia is tearing in the inside. 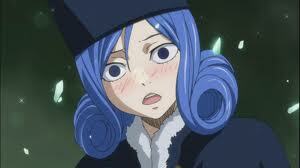 Juvia just stood there with wide eyes and shocked expression. After not being able to speak for a few seconds, she managed to put on a smile. A really awkward one at that, too. A smile that obviously failed to hide her pains and sorrows. “J-Juvia was just p-passing by,” said Juvia as she trembled and stuttered with her words. Another awkward smile and tears in the corner of her eyes. The ice mages could only stood there dumbfounded. 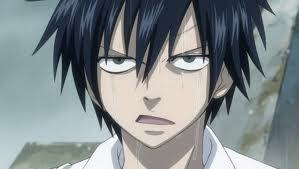 Gray opened his mouth and was about to say something when Juvia cut off his words. “S-s-she should get going now.” That forced smile was pasted on her face while she looked left and right not sure what to do. As more tears started to form in her eyes, she took a quick breath before dashing out of the two ice mages’ sight. “Juvia, wait! !” shouted the two ice mages after her. Juvia kept running and running. Gray-sama doesn’t care. Even with his cold attitude and behaviors, Juvia wanted to believe that he does care somewhere in his heart. She was hoping that at least Gray-sama cares about her a bit, just a little tiny bit. What you do to Juvia does not concern me, so just piss off! I freakin’ don’t care! So, he doesn’t care at all. *chuckle* He doesn’t care. Not at all. *chuckle* What was Juvia doing? She was holding onto this false hope and blind faith that somewhere in his cold, icy heart, there is a small place for his care toward her. Somewhere deep down within his heart. It turns out, there isn’t such place. Juvia was a fool for making herself believe that. Hic hic *started sobbing* Yeah, she is such a fool. A fool. Gray-sama never cares in the first place. Never once. *chuckle* There’s no such thing. “But it was a misunderstanding.” Gray-sama still tried to explain. Yeah, of course it was a misunderstanding. Gray-sama doesn’t care about Juvia; she was naive to think that he did. “No, that was not it!” Gray-sama protested. “Eh? Gray-san? Che, is this what it’s all about?” Gray-sama seemed confused for a while before he clickedn his tongue a bit. “About what?” Juvia is confused, too. “Suddenly starts calling Lyon, Lyon-sama. And calling me Gray-san. Are you moving on to Lyon now?” Gray-sama asked Juvia while having a cold hardened face. Eh? Moving on to Lyon-sama? Juvia has no such thoughts. “If this is what Gray-san thinks, it is up to him.” Juvia told him. Does Gray-sama have some misunderstanding toward her? “Juvia doesn’t see why Juvia cannot give him a chance. He loves Juvia after all.” Juvia is so sorry, Lyon-sama. She is just going with the flow. “So you start to like him now?” Gray-sama seemed to flinch a bit and his eyes darkened. “Che, just because someone likes you, you’re gonna like him too?” Gray-sama asked in a sharp voice. These words from Gray-sama pierced through Juvia’s heart. Just because someone likes you… Love is all that matters. Lyon-sama does loves Juvia. Doesn’t Juvia deserve happiness, too?